Snap Frames : Coordinate snap frames with these metal shelves to create an eye-catching advertising display. Powder-coated metal resists rust, corrosion, and abrasion! Deep pocket holds up to 1-3/4" of materials! Affixes to banner poles to create an effective and useful display! 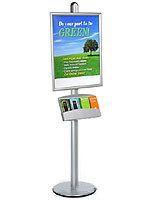 This leaflet display holds materials or information upon a banner pole to create a vertical display. It is often used by car dealerships to hold car specs below a graphic. 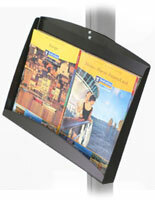 The leaflet display, such as a pamphlet display, or leaflet holder, is also ideal for restaurants. 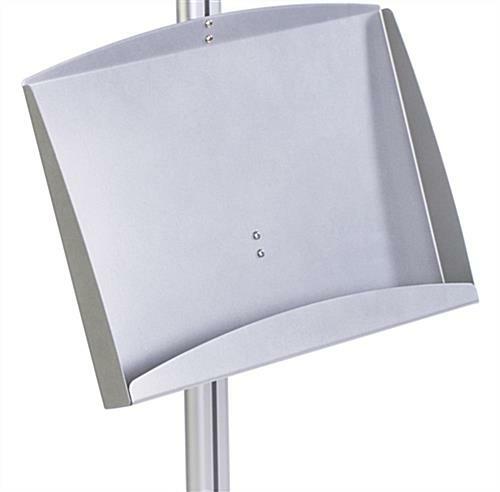 Affix a snap frame to a banner pole with the leaflet display below it to hold "TO-GO" menus. Another great use is to display new arrivals or bestsellers at a bookstore. 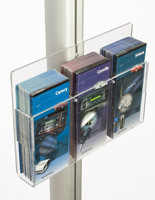 The leaflet display can even be used alone. Stack two, three, or even four displays along either side of the banner post to create a complete magazine display. 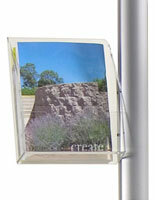 The sturdy aluminum display can hold any kind of literature, from brochures and pamphlets to magazines and books. At over 18" wide and 12" tall, it can even hold two standard-sized magazines next to each other, with complete support. The booklet display is the ideal leaflet display for retailers or other businesses looking to display materials supporting graphic images. 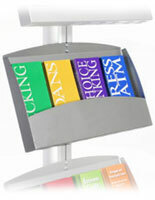 The pamphlet display, leaflet display is both durable and attractive with a powder-coated aluminum finish. 18.3" x 78.0" x 1.8"
18.0" x 13.0" x 1.6"